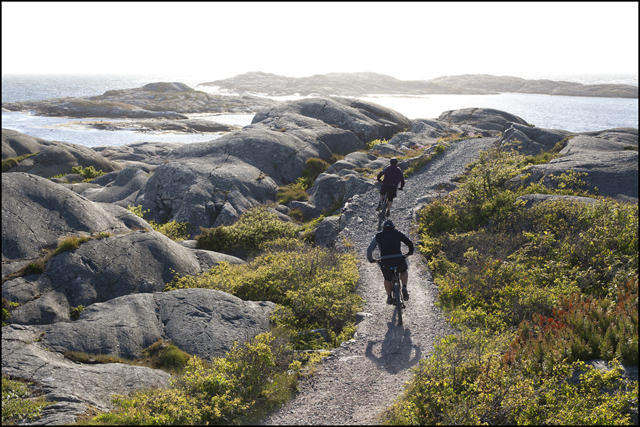 The 45 kilometer (27.9 mile) long hiking trail on the verdant hills of Kinnekulle takes about 5-6 hours to cycle. The trail is well suited for beginners, since it's not too technical and difficult. It still offers some challenge in a few places for those who demand that. The path, which offers a lot of variety, goes along both the west and east sides of Kinnekulle. On top of mount Kinnekulle you have spectacular views over the lake Vänern and the countryside. The route is marked with orange posts. Kinnekulle has been known for its nature, history and beautiful location by lake Vänern for centuries. Lake Vänern (Europe's third largest lake) archipelago with mount Kinnekulle is classified as a Biosphere reserve by UNESCO. There is no other place in Sweden where there are as many biotopes in so small area as at Kinnekulle. Kinnekulle is located two hours drive from Gothenburg. Contact us for price. Minimum 2 persons. Maximum 10 persons. Welcome to enjoy the guided tour, the catering and the stunning scenery. A small ferry goes to the Marstrand island. The island is very beautiful with a fantastic hiking trail that goes around the island. The trail is 5 km long and suits all kinds of riders. Since it's a very popular hiking trail we always ride it with caution and enjoy the views. On top of the island there's the huge Carlstens Fortress. There's also a picturesque harbour area with shops and restaurants. The Marstrand Island is located 50 km north west from Gothenburg. Transportation can be arranged if wanted. Contact us for price. Maximum 10 persons.